Nathan Graves Tuttle is a representational, figurative artist. Born and raised in Rockford, IL, Tuttle moved to Chicago to study Life Drawing at the American Academy of Art, where he received a BFA in 2012. Tuttle’s charcoal drawings are studies of the figure, often incorporating still life, and their relationships to the space they inhabit. Anonymity and depictions of the muse are reoccurring themes in his work although, Tuttle’s primary concern is to understand how form, value construction, line, and composition all work together to create a cohesive picture. 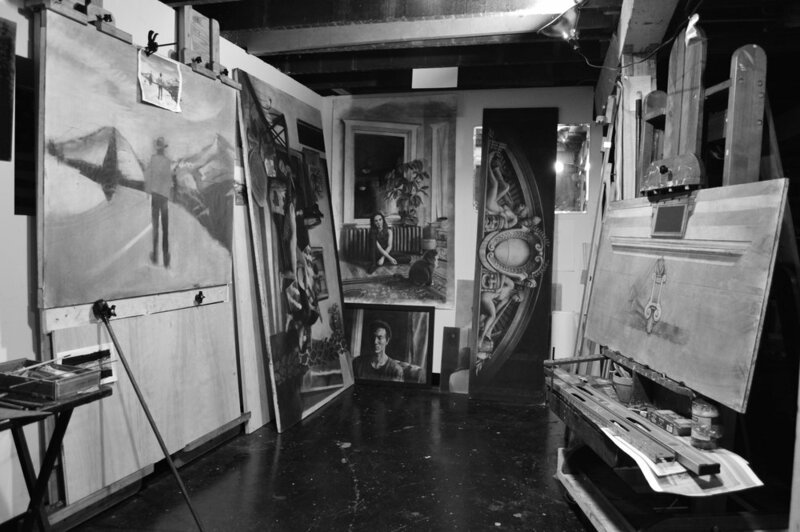 Tuttle has been represented in various group shows in Chicago. The highlight of those being “Below II” – the follow up to an exhibition he co-founded titled “Below” which he and a few colleagues originally held in a basement that they used as a shared studio space. Five years after "Below", Tuttle is building a portfolio with hopes of opening "Below III" in the near future. We admire your artistic mastery and emotion you are able to convey through your art. What are some challenges as well as victories you experienced throughout your journey as an artist so far? Thank you! Balancing working for a living while trying to maintain an active studio practice is the biggest challenge. As far as victories, so far most have been small and they have been few. An opportunity like this, for people outside of my social circles to see my work, definitely feels like a victory. Who are the figures in your pieces? Are they a part of your life or fictional characters? The figures in my work are people from my life, and my experiences, but within the picture they are fictional. They aren't intended to be actual representations of those people, or their motivations whatsoever. Were you always interested in painting the figure? Yes, as far back as I can remember. I always drew as a kid, I'd copy pictures of my favorite hockey players, and skateboarders from magazines all the time. I think that when I started school I was more concerned with just being able to study drawing not necessarily the figure, but once I got to study the figure from life on a daily basis it was pretty clear that it was exactly what I wanted to be doing. Tell us about your process and inspiration. What does a day in your studio look like? That's a difficult process to summarize. Every picture has it's own special needs and circumstances. They used to be more straight forward drawing from carefully set up reference images, but now I'm working with many references and trying to build larger more complex pictures with multiple figures occupying larger spaces. By the time a drawing is in the studio and on an easel I've gone through a lot of versions in sketchbooks and even then it's not too late for me to add or change something inside the picture. The entire process is becoming more malleable for me now and that is fun and exciting. Most of the year my work schedule makes my studio time inconsistent, so I don't have too many typical days but when I do it is just like anybody else's I would image. Just slowly chipping away at the drawings, they are all pretty large these days so it takes a lot of time. I usually keep a couple big pieces going at once so I can go back and forth to keep it fresh. Other that I'm just listening to records, and playing guitar while I break to take a step back and look at the progress. Name a few of your influences. The more predictable and contemporary influences of mine are Antonio Lopez Garcia, Euan Uglow, and Lucian Freud but I always find myself going back to guys like Edouard Vouillard, Pierre Bonnard, and Henri Matisse. What do you hope the viewer takes away from looking at your work? I've never tried to force a direct narrative into my work for the viewer to interpret, and I've found that it isn't necessary. People naturally try to place their own experiences into pictures and create a relationship with it. They certainly have meaning and relevance to my life and if people want to hear about that, I'm happy to talk about it but, I won't always be around to tell my side of it, so I hope the pictures can to speak for themselves. I set out to make pictures that I want to see, that I find interesting, and anything that someone else appreciates about that is a bonus. What are you currently reading, looking at or watching that is inspiring you? I think that as far as outside media influencing me, music is the biggest inspiration to me. Musical instruments have been creeping into my work, and the piece I just finished is full of musical references. I've just started my largest piece to date, it is a tryptic of the Civic Opera House, where I work. I have a page on my website dedicated to this drawing, where I talk about how that building has influenced me so much to the point where I felt compelled to make that drawing.